Luxury Home Steps from Elk Ave! Pool Table! 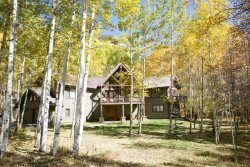 If you’re looking for a large, luxurious home just steps from downtown Crested Butte, then look no further! The Totem House is the ultimate property for a larger group seeking a truly unique experience in the high country! Steps from the front door will bring you to the soothing ripple of Coal Creek, and across the quaint foot bridge lies the lovely Totem Pole park. Just a block more and you’re right on Elk Avenue...the heart of CB! The house is also only 2 blocks from the Mountain Express shuttle stop (free) at 2nd & Elk. This home is situated in perhaps the single BEST location in town offering a perfect jumping off point for all your CB activities. Do you want space? You’ve got it! With 6 bedrooms, 5.5 bathrooms, multiple living areas and 2 decks you’ll have more than enough room to relax and entertain. This spectacular property has just been gutted and fully remodeled from top to bottom…including all new furniture, flat panel TVs and kitchen appliances! Very accommodating and pleasant to work with. Loved our stay at the Totem House. I would consider staying there again. The house is fabulous and well appointed. Lots of attention to detail. The town is a lot of fun and so cute and the mountains surrounding the town are spectacular. They Took my breath away.